Researchers at one of the world’s leading think tanks have developed a computing model that predicts serious implications for our way of life as a result of our incessant need to consume resources like oil, food, and fresh water. According to a team of scientists at the Massachusetts Institute of Technology, the breaking point will come no later than 2030, and when it does, we can expect a paradigm shift unlike any we have seen before in human history – one that will not only collapse the economies of the world, but will cause food and energy production to decrease so significantly that it will lead to the deaths of hundreds of millions of people in the process. The recent study, completed on behalf of The Club of Rome, an organization which issued it’s own findings on ‘peak everything’ back in the 1970′s in a controversial environmental report dubbed The Limits to Growth (video), takes into account the relations between various global developments and produces computer simulations for alternative scenarios. Recent research supports the conclusions of a controversial environmental study released 40 years ago: The world is on track for disaster. So says Australian physicist Graham Turner, who revisited perhaps the most groundbreaking academic work of the 1970s, The Limits to Growth. 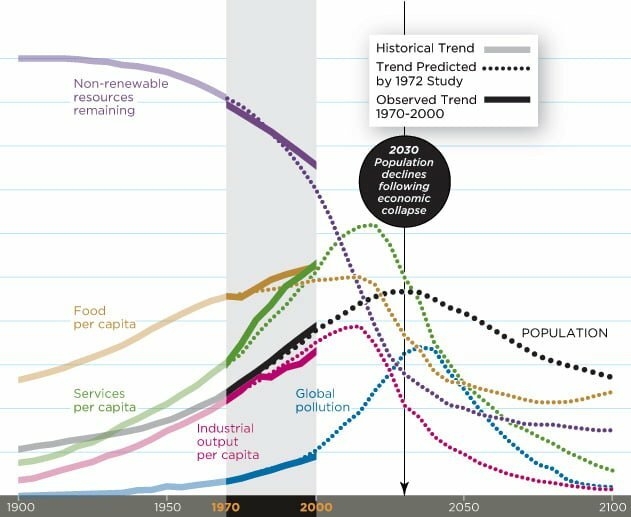 Written by MIT researchers for an international think tank, the Club of Rome, the study used computers to model several possible future scenarios. The business-as-usual scenario estimated that if human beings continued to consume more than nature was capable of providing, global economic collapse and precipitous population decline could occur by 2030. There is no doubt that the study carries with it its own agenda, as the Club of Rome includes members of the upper echelons of government and business from around the world. Many have suspected that the organization exists as a mechanism to move forward with environmental, and thus social, governance of the world’s resources and population through U.N. initiatives like Agenda 21 and the carbon credit system of taxation, both of which do nothing but shift the wealth of the world into the hands of the elite few at the top of the literal food chain. But, despite the ulterior motives of those involved in The Club of Rome, they’re not the only ones who have warned of catastrophe stemming from high population levels and unsustainable consumption. In the History Channel’s Prophets Of Doom, Collapsenet’s Michael Ruppert warned of a similar scenario and one which suggests that, while oil may still be available in the future, the costs will be so prohibitive that it will be impossible for human civilization to maintain its current levels of consumption. According to Ruppert, the last great bubble to pop will be the human population bubble. Other resource issues that have come to light in recent years include the availability of fresh water, as well as the productive capacity of our current agricultural system. Since all of our natural resources are interdependent, a break down in one, like for example the globe’s oil production system, would make it impossible for farmers to grow food, or for trucks to transport it. The same holds true for fresh water, which is essential not only to human life, but for oil exploration, refining operations, food production and a host of other industries essential to human civilization. By all accounts, we have developed a system of consumption that truly is unsustainable in the long-term. While the Club of Rome and similar organizations purport to act in the best interests of humanity, nearly fifty years of solutions have yielded nothing but more problems and have brought us ever closer to the ultimate breaking point, one which promises to wipe out potentially billions of people in its wake. An additional consideration which the MIT research study may have touched on but does not look to as a direct potential cause for global calamity is the breakdown of society as a result of unsustainable political, financial, and monetary machinations – something which benevolent members of organizations like The Club of Rome may have been complicit in creating. With seven billion people on the planet, the system as it is currently managed can’t possibility continue to support the daily needs of the world’s population indefinitely. The solutions that have been presented over the course of the last half century fall far short of providing any meaningful results, despite the treasure spent and liberty stripped. Slowly but surely we are approaching Peak Civilization, and when that bubble pops we’ll see the ‘crash’ manifest in the form of famine, disease and global conflict.